Vintage Adjustble Size Tigers Eye Gem Stone Ring. Vintage, semi precious, tigers eye gem stone cabochon, adjustable size ring. 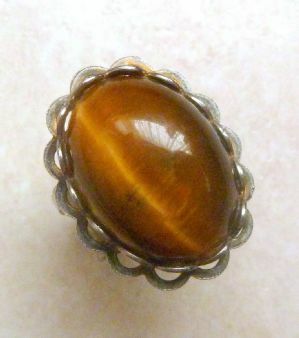 Vintage, tigers eye cabochon gem stone, adjustable size ring. The ring is formed with a large tigers eye gemstone cabochon, set in a surround of ornate silver tone metal. The ring has an adjustable fit. Circa 1960's - 70's. Sterling Silver And Tigers Eye Bracelet. Sterling silver and large tigers eye cabochon bracelet. Tigers eye gemstone, tear drop shaped drop earrings. 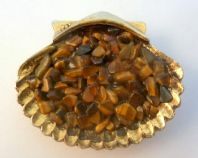 Vintage Tigers Eye Chip Gemstone Scallop Shell Brooch By Hollywood. Vintage, tigers eye gemstone chip, shell design brooch by Hollywood.